But staph infections can turn deadly if the bacteria invade deeper into your body, entering your bloodstream, joints, bones, lungs or heart. A growing number of otherwise healthy people are developing life-threatening staph infections. Treatment usually involves antibiotics and drainage of the infected area. However, some staph infections no longer respond to common antibiotics. Staph infections can range from minor skin problems to endocarditis, a life-threatening infection of the inner lining of your heart (endocardium). As a result, signs and symptoms of staph infections vary widely, depending on the location and severity of the infection. Boils. 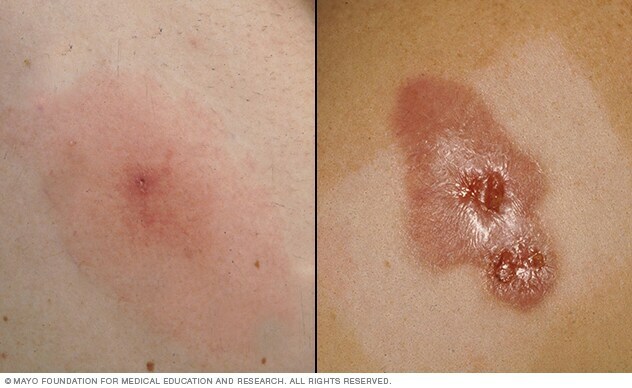 The most common type of staph infection is the boil, a pocket of pus that develops in a hair follicle or oil gland. The skin over the infected area usually becomes red and swollen. If a boil breaks open, it will probably drain pus. Boils occur most often under the arms or around the groin or buttocks. Impetigo. This contagious, often painful rash can be caused by staph bacteria. Impetigo usually features large blisters that may ooze fluid and develop a honey-colored crust. Cellulitis. Cellulitis — an infection of the deeper layers of skin — causes skin redness and swelling on the surface of your skin. Sores (ulcers) or areas of oozing discharge may develop, too. Staphylococcal scalded skin syndrome. Toxins produced as a result of a staph infection may lead to staphylococcal scalded skin syndrome. Affecting mostly babies and children, this condition features fever, a rash and sometimes blisters. When the blisters break, the top layer of skin comes off — leaving a red, raw surface that looks like a burn. Staph bacteria are one of the most common causes of food poisoning. Symptoms come on quickly, usually within hours of eating a contaminated food. Symptoms usually disappear quickly, too, often lasting just half a day. Many people carry staph bacteria and never develop staph infections. However, if you develop a staph infection, there's a good chance that it's from bacteria you've been carrying around for some time. These bacteria can also be transmitted from person to person. Because staph bacteria are so hardy, they can live on inanimate objects such as pillowcases or towels long enough to transfer to the next person who touches them. A variety of factors — including the status of your immune system to the types of sports you play — can increase your risk of developing staph infections. Staph bacteria can spread easily through cuts, abrasions and skin-to-skin contact. Staph infections may also spread in the locker room through shared razors, towels, uniforms or equipment. Food handlers who don't properly wash their hands can transfer staph from their skin to the food they're preparing. Foods that are contaminated with staph look and taste normal. If staph bacteria invade your bloodstream, you may develop a type of infection that affects your entire body. Called sepsis, this infection can lead to septic shock — a life-threatening episode with extremely low blood pressure. Wash your hands. Careful hand-washing is your best defense against germs. Wash your hands briskly for at least 20 seconds, then dry them with a disposable towel and use another towel to turn off the faucet. If your hands aren't visibly dirty, you can use a hand sanitizer containing at least 60 percent alcohol. Keep wounds covered. Keep cuts and abrasions clean and covered with sterile, dry bandages until they heal. The pus from infected sores often contains staph bacteria, and keeping wounds covered will help keep the bacteria from spreading. Reduce tampon risks. Toxic shock syndrome is caused by staph bacteria. Since tampons left in for long periods can be a breeding ground for staph bacteria, you can reduce your chances of getting toxic shock syndrome by changing your tampon frequently, at least every four to eight hours. Use the lowest absorbency tampon you can, and try to alternate tampons with sanitary napkins whenever possible. Keep personal items personal. Avoid sharing personal items such as towels, sheets, razors, clothing and athletic equipment. Staph infections can spread on objects, as well as from person to person. Wash clothing and bedding in hot water. Staph bacteria can survive on clothing and bedding that isn't properly washed. To get bacteria off clothing and sheets, wash them in hot water whenever possible. Also, use bleach on any bleach-safe materials. Drying in the dryer is better than air-drying, but staph bacteria may survive the clothes dryer. Take food safety precautions. Wash your hands before handling food. If food will be out for a while, make sure that hot foods stay hot — above 140 F (60 C) — and that cold foods stay at 40 F (4.4 C) or below. Refrigerate leftovers as soon as possible.